Heather has always been active in sports, but it wasn’t til, at the age of 23, while biking through Alaska and the Canadian Rockies that she found her passion for cycling. She then started racing and became fascinated to learn what athletes need, both mentally and physically, to achieve top performance and recovery, and avoid injury. She’s raced ‘cross, mountain, and road and loves training with Pilates and TRX, which is how she discovered Studio Blue. Heather believes in the power of massage to provide deep healing to improve physical recovery, not only from athletics but from preexisting conditions, stress, and pregnancy among other things. She knows personally massage helps people use their bodies to the best of their abilities and enhances athletic performance. Her therapeutic style is a blend of deep tissue, myofascial release, and trigger point, and she has specific interest in sports, pregnancy and postpartum, and TMJ dysfunction work. Heather began her training at the San Francisco School of Massage & Bodywork and at the McKinnon Body Therapy Center in Oakland in 2013. Over the last 6 years, Heather worked as a soigneur — a French term defined as someone who gives training, massage, and other assistance to a cycling team, especially during a race. She has accompanied UCI ProTour cycling teams, including Tinkoff, Trek, and Lampre, as well as her favorite American/Canadian Continental team, Rally. She also worked with Pablove Across America riders for 4 years and at numerous cycling team camps. 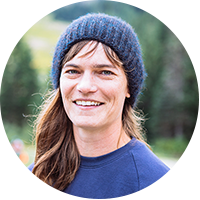 In her personal time, you’ll find Heather finding ways to get teens involved in the Oregon Interscholastic Cycling League, a non-profit that believes in youth development through mountain biking. She also enjoys cooking vegan meals, hunting through the forest for chanterelles and matsutakes, and visiting Mother Ocean.